We all want to eat right, eat well and stay in control throughout the day. We’ve got our oatmeal in the morning, our nice, neat salads at lunch, and then . . . it’s 4:00, and all heck breaks loose! Before we know it, our hands are in the bag of chocolate chips and we just can’t stop. We need to stabilize our blood sugar, so we don’t have crazy cravings all afternoon, and we keep our energy at an even flow. It’s okay to eat that 4:00 snack, but it has to be the right one. Traditional cookies use white sugar and white flour. They taste good, but they convert to glucose in our bodies way too quickly, giving us blood sugar highs-and-lows. And that leads to cravings and out-of-control eating. One cookie leads to another and another, not because we’re still hungry, but because our blood sugar is spiking. So here’s our solution. When the bewitching hour strikes, grab The 4:00 Cookie. 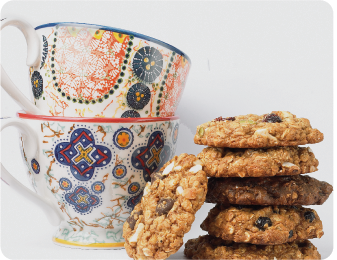 It’s made with our own blend of slow-release whole grains and low-glycemic sweeteners. 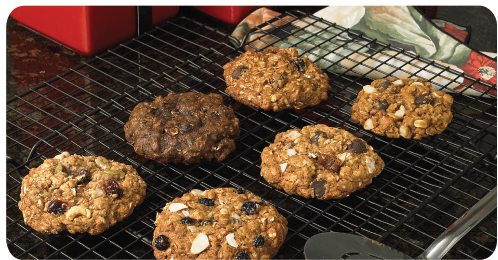 Our 4:00 Recipe uses whole wheat flour, rolled oats, flaxseeds and nuts, plus low-glycemic coconut flower sugar for sweetness. In addition to making a heck-of-a-cookie, it helps avoid that crash-and-burn sugar rush . . . which in turn, helps keep us satisfied, energized and in control. And we never want you to feel deprived, so we use figs, dried cherries, coconut, blueberries, bittersweet chocolate and more – for that little indulgence we all deserve. 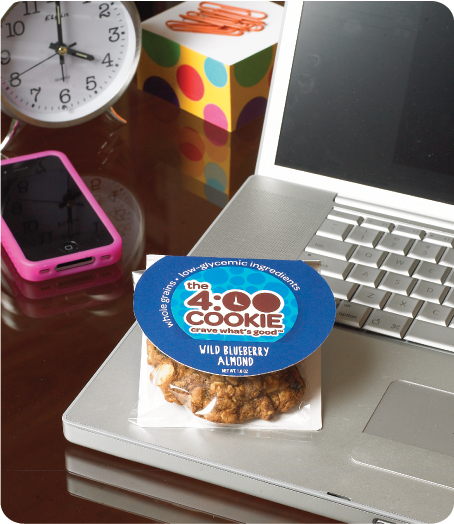 The 4:00 Cookie: just what you want, and just what you need to curb those afternoon cravings and give you a little calm, healthy energy along the way.